Last results | Results for past years | Ticket checker | Have your numbers ever won? Results for the past 12 months Results for past years Ticket checker Have your numbers ever won? *The total amount payable for prizes in a category is limited to $2,000,000 per draw. If this limit is reached, the prize amounts will be determined in proportion to the number of winning selections in the category. You may play online, using the mobile app or at a Loto-Québec retailer where you can pick your own selection or opt for selection(s) randomly generated by the Loto-Québec computer. Each selection is made up of 4 elements: a number representing a day of the month (from 1 to 31), a month (from January to December), a number representing a year (from 00 to 99) and an astrological sign (from Aries to Pisces). The days, months, years and astrological signs are not interdependent, so you may choose to bet on elements that don't usually go together. It is possible to wager on a date which does not exist, for example on February 31. 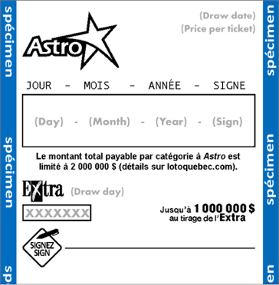 Each draw is conducted as follows: Loto-Québec conducts 4 draws to determine at random 4 elements, specifically a day (from 1 to 31), a month (from January to December), a year (from 00 to 99) and an astrological sign (from Aries to Pisces). A selection is a winner if it contains 1, 2, 3 or 4 elements identical to those drawn (see Prize structure and odds of winning). 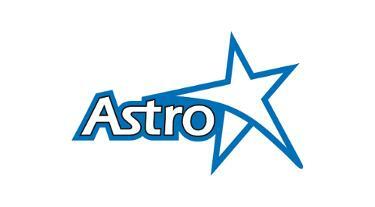 Astro is governed by the By-law respecting forecast contests and numbers games, published in the Gazette officielle du Québec, which includes limitations of liability. You may purchase selection(s) valid for more than one draw. *The total amount payable for prizes in a category is limited to $2,000,000 per draw. If this limit is reached, prize amounts will be determined in proportion to the number of winning selections in the category.